Gardeners living in USDA zones 9 through 11 can safely keep their dahlias in the ground throughout the winter months with little protection. 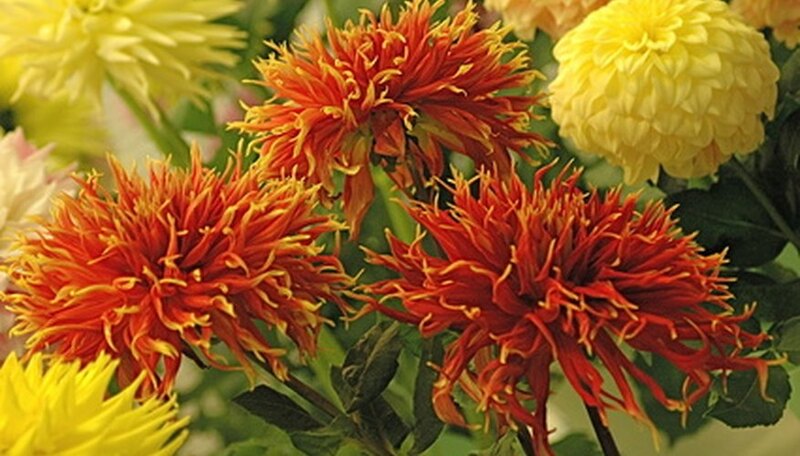 Gardeners living in USDA zone 8 can also keep their dahlias in the soil; however, they must cover the tender tubers with a thick layer of mulch. Gardeners living in colder regions must remove their dahlia tubers from the soil in the autumn to protect them from frigid temperatures. When you must cover dahlias in winter, make sure you protect them adequately to ensure viable plants the following spring. Cut back the dahlias after the first killing frost of the autumn. Use the pruning shears to cut back all plant foliage to just beneath the soil level. Discard the plant foliage. Cover the entire dahlia growing area with the plastic sheeting. Secure the sheeting over the planting area with large rocks or bricks to hold it in place. The plastic will keep excess moisture from saturating the tubers. Place 2 to 3 inches of mulch directly over the plastic sheeting to insulate the tubers. Remove the mulch and the plastic sheeting in early spring to allow the tubers to break dormancy. Do not leave the mulch and plastic over the dahlias as the weather begins to warm because you may kill the tubers with excess heat.